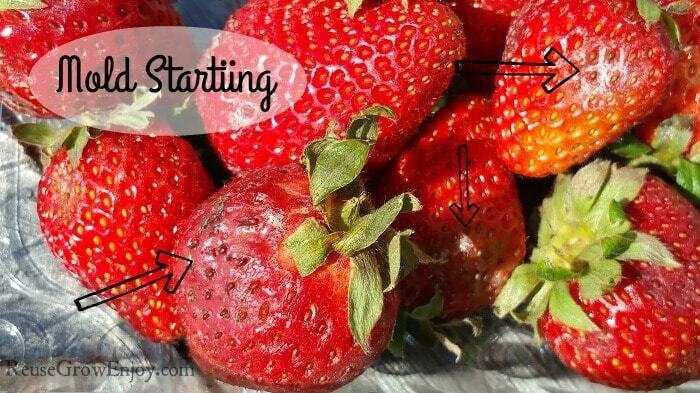 Did you know you can make your own strawberry wash right at home super easy? It helps to keep them fresh longer. Plus it is also great for other types of produce too. Have you ever bought fresh strawberries and the very next day go to use them and they are molded? Did you know there is an easy fix for that? 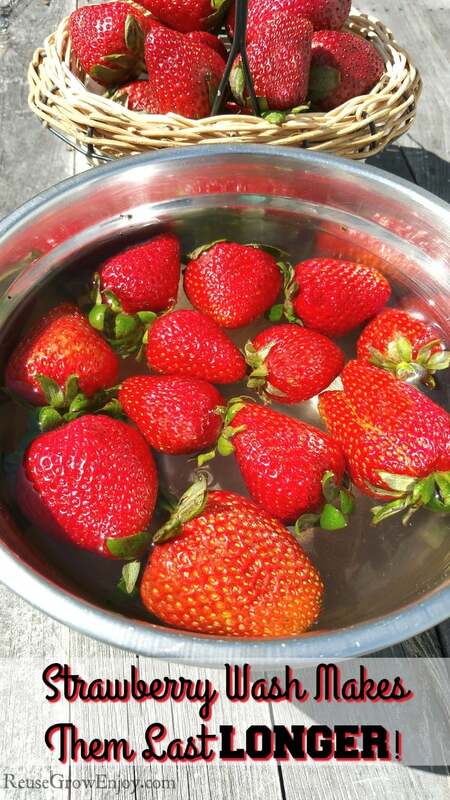 You simply need to wash them in a strawberry wash, well it is also good for other produce and berries. Lots of produce have natural mold spores on them. Berries, especially strawberries are at a higher risk of the mold to grow. When they are all stored together, it just takes one to start turning before the rest of the batch is also spoiled. That is where the strawberry wash comes into play. It will kill off the spores that are already on the fruit. By doing that, it makes the fruit last a lot longer. No, I am not saying this strawberry wash will make them last for a month, but it will make them last a heck of a lot longer than they normally do. One of the best things about this strawberry wash is that it is all natural! That means you don’t have to worry about chemicals going into your body when you eat them. Plus, I am pretty sure most of you will already have the items on hand to make it. It is super simple and only uses two ingredients. What you do is, mix equal amounts of water and white vinegar into a mixing bowl. I normally try to use a smaller bowl and wash in small batches. That way I don’t have to use up a half of a gallon of vinegar for one container of strawberries. After you have the mix in the bowl, simply add your strawberries in. Wash them around in the mix using your hands. Be sure to let them stay in the mix for about one minute. Then remove from the mix and place on a towel or paper towel and allow to air dry. DO NOT rinse them with water after they have been in the mix. After they are pretty much dry, you can put back into a clean container and place them in the fridge. You can use the container that came in after it has been washed with the same mix or there are some great produce containers on Amazon. I am sure some of you may be thinking, will my berries taste like vinegar after being in the strawberry wash? The answer, no! After they have dried, I did not taste it at all on the berries! You can just eat them like you normally would, whole, sliced, on top of a dessert or with whip cream, it is up to you. Can It Be Used On Other Produce? Yes! While I call this a strawberry wash, it can be used on other produce as well. Such as blueberries, blackberries, leafy greens and so much more. You have to love when you can make a simple produce wash with just two ingredients right at home. Here are a few other posts on strawberries you may want to check out. I love this post! Do u know if Apple cider vinegar would be an equal substitute? My son n I cannot have anything with white vinegar. I know you said you didn’t taste it but with our health issues I cannot risk that it’s still on there n jst can’t be tasted. Thx! Hi Debra, as for killing off the mold spores the apple cider vinegar should do the same thing. Now as for will it leave a taste, that I am not sure as I have not tried it. I would say, mix up a small batch and wash just a few strawberries in it first. Let them dry and then try one to see. I would hold off from doing a large batch until you try it, so you do not have a bad bunch of strawberries. When you give it a try, come back and let us know how it turned out and I can make a note in the post so others will know as to if they can use either or not. I’ve been washing all my porous fruits & veggies like this for years. One more thing that I do after the vinegar bath is to put the produce in a salad spinner. It’s surprising how much water spins off…and the spinner is gentle on theproduce! Lorrain that is a great idea with the salad spinner! I had never thought of that. Why do you suggest to not rinse after the produce has soaked? All other sites I have visited say to rinse well in cold water before air drying. Just curious as to your reasoning behind it. Thank you! Hi Kinsey, that is a great question. From what I have found when I rinse with water after the wash, they do not last as long as when I leave as is after the wash. I think that is because when you rinse with water, it washes off all the vinegar there for allowing mold spores to start growing again faster than when you leave the vinegar on.